Chicken cooked in a spicy tomato gravy and capsicum. 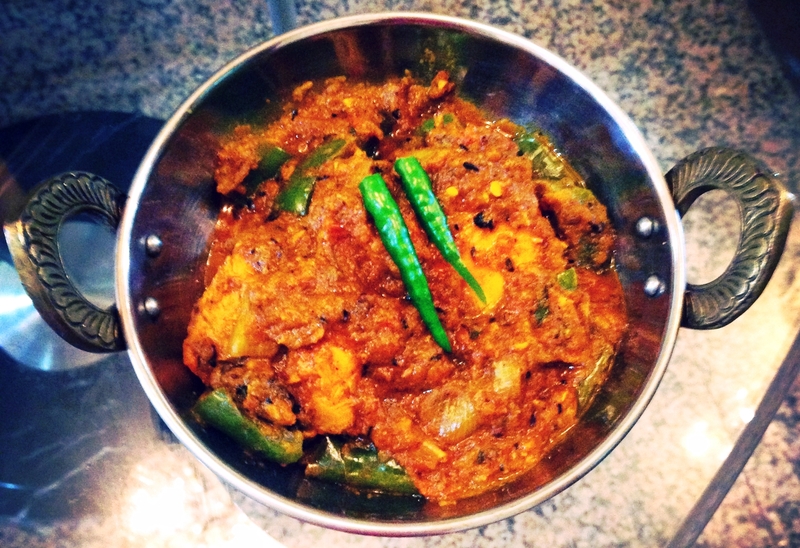 The capsicum gives unique flavour to this chicken curry. Chicken marinated with mustard oil, garam masala, chopped ginger, chopped garlic and natural yogurt for min. 45 mins. (for best results marinate chicken and keep in the refrigerator for 6-8 hrs. before cooking). Add salt to the marinade 10-15 mins. before cooking. Roast coriander seeds, cumin seeds and black peppercorns and grind to a coarse powder. Grind red chillies, ginger and garlic to a fine paste. Set aside. Heat oil in a kadhai (pan), add onion and sauté till lightly browned. Add half the coarsely ground spice powder, turmeric powder and red chilli-ginger-garlic paste and continue to sauté for three to four minutes. Add tomatoes and salt and continue to sauté till the tomatoes become soft. Add chicken and stir. Add coriander leaves and the remaining coarsely ground spice powder and mix. Add half a cup of water and stir. Add capsicum and onion pieces. Mix well and cook on medium heat till the chicken is done. Season with slit green chillies and serve hot with rumali roti or naan (Indian breads).